With a distinct smell (which is so appetizing) and a strong flavor, it is no wonder that garlic has been a kitchen staple for ages. Some do not know, however, that there are actually two main kinds of garlic: hardneck and softneck. There is a significant difference between the two which will be discussed in this article. Hardneck garlic (Allium sativum ssp. ophioscorodon), also called top-setting garlic, is named such because it literally has a hard neck. The “neck” actually refers to the stem or flowering stalk that grows through the center of the bulb. This firm stalk makes it impossible for harvesters to braid hardneck garlic. Additionally, this type of garlic has a very distinct spicy flavor and is very easy to peel because of its thick skin and large cloves. It grows very well in areas with cold climates. Upon maturity, one bulb can hold up to twelve cloves. However, it has a short shelf life of about 4 to 10 months. Softneck garlic (Allium sativum ssp. sativum),or artichoke garlic, has a very soft stalk which makes it easy to cut and braid. It has a mild flavor which is why this variety is commonly used for processed products like seasonings. This is also the same type of garlic sold in grocery stores. Furthermore, this kind of garlic thrives in warmer areas. Upon maturity, one bulb can hold up to twenty cloves, which is why it is usually large and irregular in shape. Softneck garlic also has thin, tight skin around each clove. This is the reason it is such an ordeal to peel one. This variety also has a long shelf life. 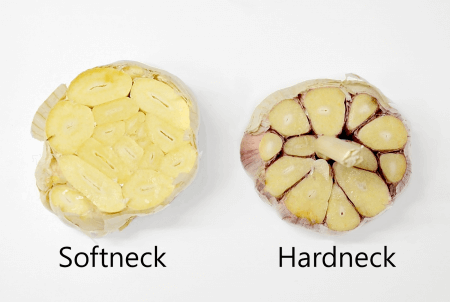 What, then, is the difference between hardneck and softneck garlic? The most obvious difference between the two is their stalk or “neck.” As the name implies, softneck garlic has a soft stalk that grows from the center of the bulb so it is easy to cut and braid, while hardneck garlic has a firm stem so it is impossible to braid. Moreover, softneck garlic usually produces bigger and imperfectly shaped bulbs which can hold more cloves than a hardneck garlic. A hardneck bulb is usually regular in shape, and can hold bigger but lesser cloves. It is also easier to peel hardneck garlic because of its thick skin. Hardneck garlic has a more powerful and spicy taste, unlike softneck garlic which has a mild taste. Also, softneck garlic can be stored longer than hardneck garlic. Additionally, softneck garlic thrives in mild and warm climates while hardneck can withstand cold climates.